Experience everything alpaca at SimplyAlpaca! Welcome to SimplyAlpaca Experiences, now's your chance to get up close to them. Being around our boys and girls brings us so much pleasure that we would like to share the "feel good" factor that they can impart to your life. Find out a little more about these beautiful animals by taking part in a half day experience to ive give you some insight into their history, care requirements and what it feels like to be with them. Perfect for anyone considering keeping alpacas for as a gift for the "alpaca-mad" person in your life. Fall in love all over again with our gentle and beguiling alpacas. They make the perfect addition to your wedding celebrations, charming and entertaining your guests. Photographs will have that extra special touch too, providing memories for a lifetime. The alpacas will also bring their own special spiritual dimension, symbolising peace and prosperity in Buddhism and Shinto. We offer a number of packages to cater for weddings of any size, all of which can be tailored to make it extra special just for you.....an experience to remember and treasure. It is well documented that holding and stroking animals can reduce blood pressure, lower pulse rates and alleviate feelings of tension and anxiety. Animals offer attention and unconditional acceptance. They are responsive, live in the ‘here and now' and don't mind who you are or what you look like. Alpacas and llamas are intelligent and inquisitive but can also be reticent with humans who fail to give adequate consideration to their needs. They are usually direct and honest and unlike humans they are non-judgemental and don't confuse through verbal communications. So are ideal for working with people who find themselves confused or threatened by human relations, many clients feel safer and less threatened around animals. Visits to farms by school children can take many forms; they can introduce children to new animals, to the work of looking after them, the reasons for keeping them or provide innovative ways to explore curriculum subjects. They can last an hour, a day or take place once a term. The possibilities are endless! 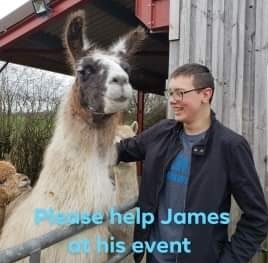 Camelid Connection at SimplyAlpaca would like to offer the opportunity to all children and young people to take part in on-farm alpaca and llama-related activities. We aim to offer a unique and memorable learning experience. Our training is based on the Camelidynamics approach which is a respectful and effective way to train and handle llamas and alpacas. Victoria is a Senior Camelidynamics Consultant and has trained extensively with its founder. We will help you to learn how to train and manage your llamas and alpacas in a way that gives you an understanding of their behaviour and the importance of balance and leverage in paving the way for cooperation instead of relying on restraint and force. You will learn a set of skills that once mastered, make every animal easier to work with. Whether your difficulty lies in catching, haltering, and leading or husbandry tasks like injections or toe nail trimming, this approach based on Camelidynamics principles offers respectful, scientifically sound answers that anyone can learn and use safely and effectively. Come and enjoy our animals in their home setting and take the opportunity to learn about the fibre as it comes from the animals, its preparation and use. Have go at spinning and felting and leave the day have created an original and unique piece. Stuck for original ideas for a birthday, hen, retirement and any other party? Would love something a bit different that is educational as well? These are celebration parties with a difference. A never to be forgotten experience of getting up close to the alpacas with an opportunity to stroke and handle them. During the first session we introduce the idea of respect for the animals by feeling what it is like to be an alpaca on a lead before going on to meet the animals in person. Then we use those skills to guide them around our own "Alpaca Challenge Obstacle Course" or take them for a stroll around the fields - alpacas are really curious and love the chance to get out and about. Back in The Studio we can get stuck into having some fun with some of the alpaca's fibre, trying out the craft of felt-making and making something to take home with you. Following that we can sit down to hearty but healthy party food. Check out the party packages and if there is anything missing for you we can be flexible and are willing to discuss individual requirements. Stuck for original party ideas for a bithay, hen, retirement or other party? As we have used Camelidynamics principles for halter and lead training, our animals are trusting and willing trail blazers, vying to be at the front of the queue when it comes to choosing who is coming out today. Our family and friends enjoy a different sort of walk! We would like to offer this exciting and unusual opportunity to you. We offer week day and weekend guided walks subject to the weather and availability. We also do Trekking Gift Vouchers for the person who has or has done everything. Email to order and book when you are ready. Vouchers are valid for 12 months after purchase. Mothering Sunday 31st March Mother's Day, or Mothering Sunday is a day to show love, gratitude and appreciation to all wonderful mums everywhere. 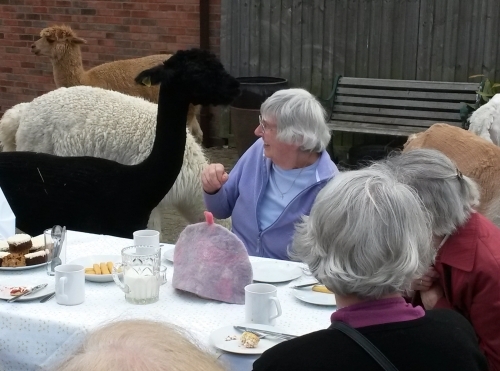 Show how you feel by joining us for an alpaca walk and cream tea at 2pm. Gift vouchers available. "My daughters adore animals and we were looking for a birthday party that was a bit different - and SimplyAlpaca was just fantastic! The animals were wonderful and so patient with the children, and the felt making was really clever - interesting for the adults to see how it was done too! Victoria made sure that all the children were having a good time, and the homemade food was delicious. Thank you for a memorable day." Debbie Feb 2016.